Toyota Alabama President David Fernandes and Team Member Phillip Powell perform a quality confirmation check during the final stages of assembly on the plant’s newest 4-cylinder line. In August 2018, Toyota Motor Manufacturing Alabama (TMMAL) celebrated the production of its six millionth engine. By the end of 2018, the plant’s annual production was approximately 630,000 engines, roughly 2,600 engines per day and five times as many engines produced as when it began operations in 2003. TMMAL President David Fernandes, who has been with Toyota for 19 years and has served as president of Toyota Alabama for two years, credits that volume to the dedication of the plant’s 1,400 team members. Looking ahead to 2019, Fernandes anticipates another high-volume year to meet market demand, due in part to the plant’s unveiling of a new 4-cylinder engine in October 2018 as part of its Toyota New Global Architecture (TNGA) platform. The TNGA engine, a $106 million investment for the company, will replace the plant’s current 4-cylinder line and, for now, is being manufactured for Toyota’s RAV4 model. “TNGA will improve the performance of all vehicles,” says Fernandes. Features include increased fuel efficiency, reduced emissions, more responsive handling and providing a more stable and comfortable drive. “Also, by investing in a more flexible production environment, we can build ever-better cars for our customers now and respond quicker to market demands down the road.” Most vehicles produced in North America are slated to adopt TNGA with their next full model changes. The Alabama facility is the only Toyota plant globally that produces 4-cylinder, V-6 and V-8 engines under one roof. Its engines go into five of the 10 Toyota models manufactured in North America. Currently, roughly 41 percent of its production volume lies in V-6 engines built for the Tacoma and Highlander, 36 percent is 4-cylinder engines for the RAV4 and Highlander, and 23 percent is the large V-8 engines that go into the Tundra and Sequoia models. Looming over those impressive production numbers, however, is the potential impact that rapid changes to trade policy could have on the plant, particularly its exports. Half of the engines produced at TMMAL are shipped to Canada and Mexico. Fernandes is naturally concerned. “Tariffs threaten to increase the cost of our vehicles, which could harm the industry by impacting sales, production volumes, ultimately jobs.” He adds that the cost of Toyota Tundras, for which his plant builds engines, is estimated to increase by $2,800. In January 2018, Toyota and Mazda announced they would open an auto plant in Huntsville anticipated to produce 300,000 cars annually and employ as many as 4,000 people. Groundbreaking took place in November 2018, just 14 miles away from the TMMAL engine plant. 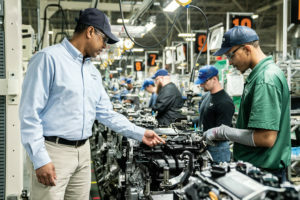 Fernandes credits a significant part of Toyota’s decision to expand its U.S. footprint in Huntsville to the strong community ties his plant has established over the years. That sort of collaborative spirit has become part of the bedrock of TMMAL and is especially apparent in its focus on expanding its workforce development efforts. In partnership with Calhoun Community College, TMMAL created the Alabama Federation for Advanced Manufacturing Education Advanced Manufacturing Technician Program in 2014. The program, which allows students to gain workplace experience and make a salary while earning their degree, has helped develop a pipeline of skilled maintenance technicians for the Toyota engine plant. Since the program began, it has expanded to include 12 other companies that also sponsor students. Ogle stresses the importance of starting workforce development early. “The key is engaging with students as early as elementary school to get them excited about career fields that they don’t even know exist,” she says. In addition to its classroom-to-career approach, TMMAL has also partnered with Alabama Industrial Development and Training (AIDT) for new hire assessment and training. Trainees attend orientation classes at AIDT’s Robotics Technology Park in North Alabama, where they are given specific information about their job and its requirements and participate in a series of hands-on testing that helps determine their skill sets. “The labor market in North Alabama is very competitive and as a result, we continually work to develop comprehensive strategies for the recruitment and training of team members,” says Fernandes. To date, Toyota has invested more than $24 billion in its U.S. operations and has committed to an additional $8 billion over the next five years. “These investments demonstrate our ongoing commitment to the U.S. and, of course, our team members and the communities where we do business,” Fernandes says. Katherine MacGilvray is a Huntsville freelancer for Business Alabama.